Za’atri refugee camp in Jordan, 2014. 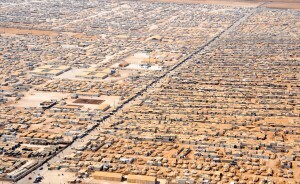 Home to 83,000 Syrian refugees. Wikimedia Commons. Right now, it would be judicious of the Conservative government to relax its tight restrictions on refugee sponsorship and annual quotas in order to gain favour during an election campaign. But what is really needed is an election campaign that puts forward an overall and ongoing framework of inclusion and compassion for refugees in addition to a politically-expedient and crisis-driven response. The world’s attention is focused on the current crisis of human security in which thousands of Syrians and others from the Middle East and Africa are seeking asylum mainly in Europe. Many Canadians are demanding that our governments at all levels do more to open the nation’s gates to desperate people fleeing conflict in their homelands. Often, reference is made to Canada’s history of welcoming refugees, especially the more than 60,000 people who came to this country from Southeast Asia over a period of just two years in the late 1970s, or the 5,500 who were whisked to safety out of Kosovo in 1999. Such cases of what we view as compassion in refugee reception were not specific to the political party in power at a given time. Nor were examples of exclusion towards asylum-seeking people limited to one party either. Governments react in positive ways to refugee crises because of a number of factors – citizen lobbying and pressure to open the doors, the state of the economy and thus its capacity to incorporate newcomers, and the political nature of the conflict that produces refugees (for example, during the Cold War era, Canada more easily welcomed refugees from left-wing regimes than it did from right-wing dictatorships). The co-existence of compassion and exclusion in Canada’s response to refugees goes way back. In 1847 40,000 refugees from the Irish famine arrived by ship in the harbor at Toronto, then a small city with a population of 20,000! There was hostility towards these newcomers – expressed in signs posted in business windows that said ‘no Irish allowed’ – but Torontonians also demonstrated selfless compassion by erecting makeshift hospitals to care for the sick. While our current party system was not in place in this pre-Confederation era, there was a familiar tension between the anti-Irish Protestant officials governing the city and the citizens and churches that put themselves at risk by reaching out to help. My own Mennonite grandparents, seeking to escape the new communist regime in the Soviet Union, might not have immigrated to Canada in 1924 had the gates remained closed to exclude them after the First World War. In 1919, the coalition Unionist government of Robert Borden placed a ban on the admission of Mennonites and other religious groups that had “peculiar customs,” specifically their pacifist beliefs. After Mackenzie King and his Liberals won the 1921 election and overturned the ban, 20,000 Mennonites immigrated to Canada over the next decade, and many voted Liberal for years as a gesture of gratitude. 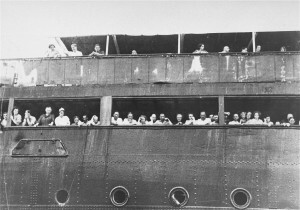 Jewish refugees aboard the SS St. Louis, 1939. United States Holocaust Memorial Museum. But it was the same Liberal government that, in 1939, turned away the S.S. St. Louis, a shipload of almost 1,000 Jewish refugees who were desperately trying to escape Nazi death camps in Europe. This stance occurred despite an outcry in favour of their admission on the part of Canadian Jews, Christians, and other compassionate people – similar to what we are witnessing today in support of Syrian refugees. At least a third of those Jewish refugees went to their deaths upon the ship’s return to Europe. The same government dragged its feet in opening the doors to the hundreds of thousands of refugees displaced from their homes in Europe during the Second World War. It was public pressure and an improving economy that compelled a more expansive approach beginning in 1947 – a full two years after war’s end. Largely motivated by ideological posturing at the height of the Cold War, it was a Liberal government that expedited the migration of 37,000 Hungarian refugees in just a few months. But public pressure from ethnic and religious groups also played an important role. It was again the Liberals led by Pierre Trudeau that acted swiftly to admit South Asian refugees who were expelled from their homes in Uganda in the early 1970s, but the minority government at the time depended on the support of the New Democrats. Although Trudeau’s government, with a new Immigration Act in hand, initiated Canada’s response to the Indochinese crisis of the 1970s, it was Joe Clark’s Conservatives, newly elected in June 1979, that moved forward a broad private sponsorship program which saw flights of refugees arrive in Canada every three days. There were certainly exceptions, but we still point to this as the pinnacle of Canadian compassion towards refugees. Under the Conservative government of Brian Mulroney, thousands of political refugees from civil wars in Central America found new homes in Canada. These examples show that government responses to refugee crises – whether of welcome or exclusion – are not limited to one political party. A question to ask of all candidates during this election campaign is whether his or her party’s immigration policy has compassion for and service to others at the core of its agenda. Marlene Epp teaches history and peace & conflict studies at Conrad Grebel University College at the University of Waterloo. She is a board member of Mennonite Coalition for Refugee Support. Thanks for this timely article. Just a note about the “peculiar customs” of the Mennonites and other groups …. I think at the time “peculiar” was used to mean “specific to,” which is often cited as the second definition of peculiar, rather than “strange, odd, or unusual.” Please correct me if I’m wrong!